What if the Lady Vol's Oregon players decided to stay home and play? OSU could've had a backcourt next year of Slocum and Westbrook. They'll be fine with Slocum and Pivec. What is Holly crying about in the postgame? What has the team had thrown at them? Yikes, that was uncomfortable to watch. 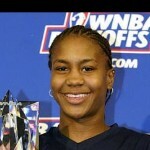 Westbrook could transfer...She doesn't look all that happy playing for Warlick. I don't know what she was crying about but I said in another thread that the team wouldn't make it to the sweet 16 and I was correct. Bu,bu,but.....Tennessee will be a better team without Diamond Deshields. Honestly she could and i doubt any LV fan would complain. She was #1 in some recruiting services and im still confused on how. Tennessee just is not getting those top level athletes like back in the day. Wonder how UCONN and ND fair when their respective coaches step down. Can CD keep the juggernaut rolling? What about Neile Ivey? Tennessee just is not getting those top level athletes like back in the day. Wonder how UCONN and ND fair when their respective coaches step down. Can CD keep the juggernaut rolling? What about Neile Ivey? Are they not getting the athletes or are they not developing them properly? As for your question about UConn and ND, it depends on who ends up replacing the coaches. Although they likely won't be quite as dominant as they are now, if they hire good enough coaches, they could still be regular contenders. And I seriously doubt CD would replace Auriemma. My bet is that they retire together. C'mon, Claire Danes has a lot of good years left. Ok, I get it, but where's the proof? I mean, does losing in Rd 2 prove it? Would Tenn have won w/DD? Since everyone seems to think the LVs needed 3-pt shooting more than anything yesterday, what does the record show DD would have brought to the court? She shot .333 last year. A whole lot of crap from a group known sometimes as "the fans on the hill" who are only fair-weather fans. They hate her because she isn't Pat, and they take it out on the players. Diamond's not a one trick pony.She can score the ball a myriad of ways(post,transition,cutting to the basket,offensive rebouding,3 pt shot,mid range jump shot,FT line) Diamond can also create her own shot,and is a very good defender. The so called "Fab Four" are FRESHMEN and still prone to freshman mistakes, FFS. Leave it alone. The only reason I can see Dailey doing it is to be a buffer for the *next* coach. You never want to be the one who follows the legend, after all. And even then I find it unlikely. I'm familiar w/ her game. The main take away from it is inconsistency. She can look real good, and real bad. She can get hot, she can shoot bricks. She can jump high and is fast, but I wouldn't call her a great defender. (Not that you did either). Her A/TO ratio is barely above 1. She isn't a "senior leader"-type, either. She's fun to watch, though, for those few moments each game when her athletic ability and basketball skills intersect and we all go WOW!. I'd love to watch her in a pick up game. That could also be a way of boosting her pension if she takes a few years at a head coaches pay. Part of it is the Pollyanna expectations placed on the freshmen's shoulders by the fans. Every year the freshman du jour are going to lead the Vols back to the top. They are thrown on the court and naturally do what they were good at in high school. And they never advance from there. There are more advanced offensive schemes on playgrounds. UConn will likely fall when the coach leaves but he will leave a system that works. Pat took everything with her. But those "fans on the hill" are mostly complaining about the performance of the team as a whole and the bulk of the criticism has been towards Warlick and the coaches and not the players. As for what will happen at UConn and N Dame, if those schools enshrine the current coaches, keep an empty seat on the bench to remind everyone who ISN'T the coach, and hire replacements mostly because they worshiped the previous head coach then they get what they deserve. It's time for Tenn to move on. For a top 5 Division 1 women's basketball program, you never, never, except in an absolutely rare situation do you want to promote an assistant coach to the head coach position. They are not ready and have not sat in the big chair. That's the purpose of Division II and unheralded Division ! basketball programs to educate, train and give experience to first time head coaches. They need to get their feet wet, make the big decisions, run a program, recruit, interact with players from the head coach position, interact with assistant coaches etc. etc. etc. Send them out for four or five years to get experience. Sitting next to the big chair is not the same as sitting in the chair. Warlick is getting OJT (on the job training) at the expense of the program, players, fans and supporters. The experience she would have gotten at another school or two would have provided her with an in-depth education and she would have experienced making the right and wrong moves that would have benefited her once she was ready to move up. Tennessee! Taking nothing away from Summitt, you need to put the Summitt goddess image and legend behind you and move strongly into the future. Fire Warlick right now and clean out the underbrush. It's time for a new start. Come on, "Let's Make Tennessee Great Again!"